History of London London Pass the entry to London sighseeing places. Buy londonpass online. London is probably the most famous city in the world, London is the capital of the United Kingdom, Although many people know a lot about the historical figures of London but its history is not all that talked about. London has a recorded history that goes back over 2,000 years. Although at present London has grown to become one of the financial and cultural capitals of the world. It has also experienced plagues, devastating fires, civil wars, aerial bombardments and terrorist attacks. Word London there is no set record that explains where the word Londone came from however there have been many theories presented over the centuries for the origin of the word London: most can be dismissed as fanciful on linguistic or historical grounds, while a few have some measure of academic plausibility. None have any direct evidence. According to the legendary Historia Regum Britanniae, of Geoffrey of Monmouth, London was founded by Brutus of Troy after he defeated the incumbent giants Gog and Magog and was known as Caer Troia, Troia Nova, or New Troy, which, according to a pseudo-etymology, was corrupted to Trinovantum. ( The Trinovantes were the Iron Age tribes who inhabited the area prior to the Romans). Geoffrey says prehistoric London had a rich array of legendary kings, such as King Lud who, he claims, renamed the town CaerLudein, from which London was derived, and King Lud was buried at Ludgate. However, despite intensive excavations, archaeologists have found no evidence of a prehistoric major settlement in the area. This may be because of the numerous changes in the topography and continues buildings there may be nothing preserved for archeologist. There have been scattered prehistoric finds, evidence of farming, burial and traces of habitation, but nothing more substantial. It is now considered unlikely that a pre-Roman city existed, but as some of the Roman city remains unexcavated, it is still just possible that some settlement may have yet to be discovered in the near about or future archeologists develop a method to dig the earth on existing structures. It is believed that in prehistoric times, London was most likely a rural settlement only. Rich finds such as the Battersea Shield, found in the Thames near Chelsea, suggest the area was important; there may have been important settlements at Egham and Brentford, and there was a hill fort at Uppall, but no city in the area of the Roman London, the present day City of London. Numerous finds have been made of spear heads and weaponry from the Bronze and Iron ages near the banks of the Thames in the London area, many of which had clearly been used in battle. This suggests that the Thames was an important tribal boundary. Londinium was established as a civilian town by the Romans about seven years after the invasion of AD 43. Early Roman London occupied a relatively small area, roughly equivalent in size to Hyde Park. In around AD 60, it was sacked by the Iceni led by their queen Boudica. However, the city was quickly rebuilt as a planned Roman town and recovered after perhaps 10 years, the city growing rapidly over the following decades. During the 2nd century Londinium was at its height and replaced Colchester as the capital of Roman Britain (Britannia). Its population was around 60,000 inhabitants. It boasted major public buildings, including the largest basilica north of the Alps, a governor's palace, temples, bath houses, amphitheatre and a large fort for the city garrison. Political instability and recession from the 3rd century onwards, however, led to a slow decline. At some time between 190 and 225 AD the Romans built the defensive London Wall - around the landward side of the city. The wall was about 3 kilometres (2 miles) long, 6 metres (20 ft) high, and 2.5 metres (8 ft) thick. 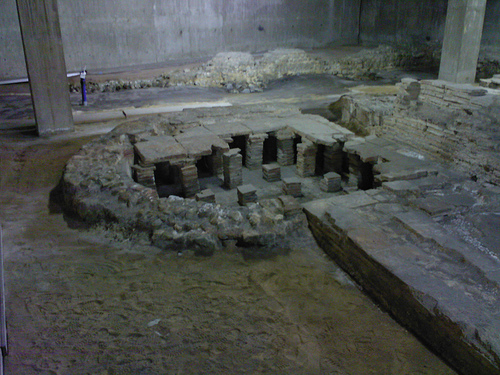 In the late 3rd century, Londinium was raided on several occasions by Saxon pirates. This led, from around 255 onwards to the construction of an additional riverside wall. The wall would survive for another 1,600 years and define London's perimeters for centuries to come. Six of the traditional seven city gates of London are of Roman origin, namely: Ludgate, Newgate, Aldersgate, Cripplegate, Bishopsgate and Aldgate (Moorgate is the exception, being of medieval origin). By the 5th century the Roman Empire was in rapid decline, and in 410 AD the Roman occupation of Britain came to an end. Following this, the Roman city went into rapid decline and by the end of the century had been practically abandoned. Following the virtual abandonment of the Roman city, the area's strategic location on the River Thames meant that the site was not deserted for long. From the 6th century, Anglo-Saxons began to inhabit the area. Although early Anglo-Saxon settlement avoided the area immediately around Londinium, there was occupation on a small scale of much of the hinterland on both sides of the river. There is no contemporary literary evidence, but the area must for some time have been an active frontier between Saxons and Britons. From the mid-6th century, the London area was incorporated into the East Saxons kingdom, which extended as far west as St Albans and included all of later Middlesex, and probably Surrey, too, for a time. In 604 Saeberht of the East Saxons converted to Christianity and London received Mellitus, its first post-Roman bishop. At this time Essex owed allegiance to the Bretwalda Æthelberht of Kent, and it was under Æthelberht that Mellitus founded the first St. Paul's Cathedral, traditionally said to be on the site of an old Roman Temple of Diana (although Christopher Wren found no evidence of this). This would have only been a modest church at first and may well have been destroyed after he was expelled from the city by Saeberht's pagan successors. Later in the 7th century a Saxon village and trading centre named Lundenwic ("London settlement") was established approximately one mile to the west of Londinium. The new town came under direct Mercian control in c.730 as the East Saxon kingdom of which it had once been part was gradually reduced in size and status. Mercian lordship was replaced by that of Wessex after 825. Alfred the GreatViking attacks dominated most of the 9th century, and such attacks became increasingly common from around 830 onwards. There were attacks on London in 842 and 851. In 865 the Viking "Great Heathen Army" launched a large scale invasion of East Anglia, and by 871 they had reached London, and are believed to have camped within the old Roman walls during the winter of that year. Although it is unclear what happened during this time, London may have come under Viking control for a period. In 878 however, English forces led by King Alfred the Great defeated the Vikings at the Battle of Edington and forced the Viking leader Guthrum to sue for peace. English rule in London was restored and within ten years settlement within the old Roman walls was re-established to improve defences, but known as Lundenburgh. The Roman walls were repaired and the defensive ditch re-cut. As the focus of the city was moved back to within the old Roman walls, the older settlement of Lundenwic gained the name of ealdwic or "old settlement". The name survives today as Aldwych. 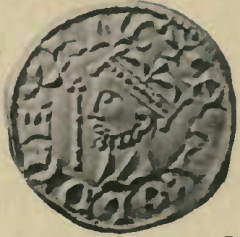 Alfred appointed his son-in-law Æthelred, who was the heir to the destroyed Kingdom of Mercia, as Governor of London and established two defended Boroughs to defend the bridge which was probably rebuilt at this time. The southern end of the Bridge was established as the Borough of Southwark or Suthringa Geworc (defensive work of the men of Surrey) as it was originally known. From this point, the City of London began to develop its own unique local government. After Aethelred's death, London came under the direct control of English kings. By the early 10th century London had become an important commercial centre. Although the capital of the Kingdom of England was in Winchester, London became increasingly important as a political centre. King Aethelstan held many Royal Councils in London and issued laws from there. King Aethelred the Unready favoured London as his capital and issued the Laws of London there in 978. 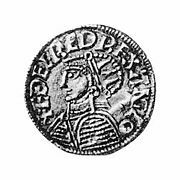 It was during the reign of Aethelred that Viking raids began again, led by King Sweyn Forkbeard of Denmark. London was unsuccessfully attacked in 994, but numerous raids followed. By 1013 London was being besieged and Aethered fled abroad. King Sven died but his son Canute continued the attacks and eventually overran the city. Runestone Dr 337 was raised in memory of two Vikings who died in London.A Norse saga tells of a battle during the Viking occupation where Aethelred returned to attack Viking-occupied London. According to the sage, the Danes lined London Bridge and showered the attackers with spears. Undaunted, the attackers pulled the roofs off nearby houses and held them over their heads in the boats. Thus protected, they were able to get close enough to the bridge to attach ropes to the piers and pull the bridge down, thus ending the Viking occupation of London. There is some speculation that the nursery rhyme "London Bridge is falling down" stems from this incident. The Vikings however returned and Aethelred's son Edmund Ironside initially managed to hold back the invaders. However, he was eventually forced to share power with Canute. When Edmund died Canute became the sole King of England. 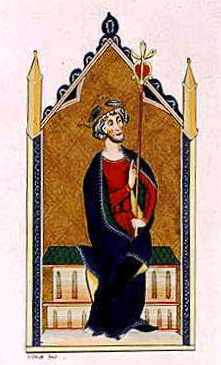 After two short lived Danish kings, the Anglo-Saxon line was restored when Canute's stepson Edward the Confessor took up the throne in 1042. Following Edward's death, no clear heir was apparent, and his cousin, Duke William of Normandy, claimed the throne. The Royal Council, however, met in the city and elected the dead King's brother-in-law, Harold Godwinson as King. He was crowned in Westminster Abbey. William, outraged by this, then sent an army to invade England. London in 1300.The Norman invasion of Britain in 1066 is usually considered to be the beginning of the Medieval period. William, Duke of Normandy, killed English king Harold Godwinson in the Battle of Hastings. Although he burnt down Southwark, south of the bridge, he avoided London, instead waiting to the north-west at Berkhamsted until the city officials in London recognised him as King. They quickly did so, and William responded by granting the city a formal charter. Under William (now known as William the Conqueror) several royal forts were constructed along the riverfront of London (the Tower of London, Baynard's Castle and Montfichet's Castle) to defend against seaborne attacks by Vikings and prevent rebellions. 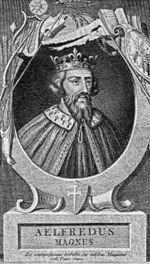 William the Conqueror also granted a charter in 1067 upholding previous Saxon rights, privileges and laws. Its growing self-government became firm with election rights granted by King John in 1199 and 1215. In 1097 William Rufus, the son of William the Conqueror began the construction of 'Westminster Hall'. The hall was to become the basis of the Palace of Westminster which, throughout the Medieval period, was the prime royal residence. The Tower of London. In 1176 construction began of the most famous incarnation of London Bridge (completed in 1209) which was built on the site of several earlier wooden bridges. This bridge would last for 600 years, and remained the only bridge across the River Thames until 1739. May 1216 saw the last time that London was truly occupied by a continental armed force, during the First Barons' War. This was when the young Louis VIII of France marched through the streets to St Paul's Cathedral. Throughout the city and in the cathedral he was celebrated as the new ruler. It was expected that this would free the English from the tyranny of King John. This was only temporarily true. The barons supporting the 29-year old French prince decided to throw their support back to an English king when John died. Over the next several hundred years, London would shake off the heavy French cultural and linguistic influence which had been there since the times of the Norman conquest. The city, like Dover, would figure heavily into the development of Early Modern English. During the medieval period London grew up in two different parts. The nearby up-river town of Westminster became the Royal capital and centre of government, whereas the City of London became the centre of commerce and trade. The area between them became entirely urbanized by 1600. Trade and commerce grew steadily during the Middle Ages, and London grew rapidly as a result. In 1100 London's population was little more than 15,000. By 1300 it had grown to roughly 80,000. Trade in London was organized into various guilds, which effectively controlled the city, and elected the Lord Mayor of the City of London. Medieval London was made up of narrow and twisting streets, and most of the buildings were made from combustible materials such as wood and straw, which made fire a constant threat. Sanitation in London was poor. London lost at least half of its population during the Black Death in the mid-14th century. Between 1348 and the Great Plague of 1665 there were sixteen outbreaks of plague in the city. John Norden's map of London in 1593. There is only one bridge across the Thames, but parts of Southwark on the south bank of the river have been developed.The Tudor period from 1485 until 1603 was a dramatic period of English history. Three of the monarchs of the Tudor dynasty (Henry VII, Henry VIII and Elizabeth I) played important roles in transforming England from a comparatively weak European backwater into a powerful state that in the coming centuries would dominate much of the world. 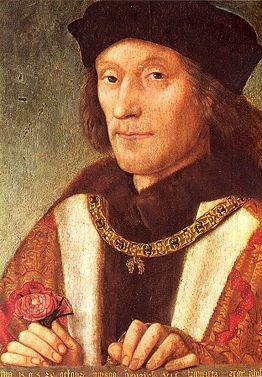 The period saw the end of the War of the Roses the English Reformation and the Elizabethan era. The Reformation produced little bloodshed in London, with most of the higher classes co-operating to bring about a gradual shift to Protestantism. Before the Reformation, more than half of the area of London was occupied by monasteries, nunneries and other religious houses, and about a third of the inhabitants were monks, nuns and friars. Thus Henry VIII’s “Dissolution of the Monasteries” had a profound effect on the city as nearly all of this property changed hands. The process started in the mid 1530s, and by 1538 most of the larger houses had been abolished. Holy Trinity Aldgate went to Lord Audley, and the Marquess of Winchester built himself a house in part of its precincts. The Charterhouse went to Lord North, Blackfriars to Lord Cobham, the leper hospital of St Giles to Lord Dudley, while the king took for himself the leper hospital of St James, which was rebuilt as St James's Palace. The period saw London was rapidly rising in importance amongst Europe’s commercial centres, its many small industries were booming, especially weaving. Trade expanded beyond Western Europe to Russia, the Levant, and the Americas. This was the period of mercantilism and monopoly trading companies such as the Russia Company (1555) and the British East India Company (1600) were established in London by Royal Charter. The latter, which ultimately came to rule much of India, was one of the key institutions in London, and in Britain as a whole, for two and a half centuries. In 1572 the Spanish destroyed the great commercial city of Antwerp, giving London first place among the North Sea ports. Immigrants arrived in London not just from all over England and Wales, but from abroad as well, for example Huguenots from France; the population rose from an estimated 50,000 in 1530 to about 225,000 in 1605. The growth of the population and wealth of London was fuelled by a vast expansion in the use of coastal shipping to import coal from Newcastle. The late 16th century, when William Shakespeare and his contemporaries lived and worked in London, was one of the most lustrous periods in the city’s cultural history. 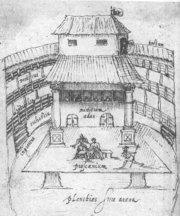 There was considerable hostility to the development of the theatre however. Public entertainments produced crowds, and crowds were feared by the authorities because they might become mobs, and by many ordinary citizens who dreaded that large gatherings might contribute to the spread of plague. Theatre itself was discountenanced by the increasingly influential Puritan strand in the nation. However, Queen Elizabeth loved plays, which were performed for her privately at Court, and approved of public performances. London's expansion beyond the boundaries of the City was established in the 17th century. In the opening years of that century the immediate environs of the City, with the principal exception of the aristocratic residences in the direction of Westminster, were still considered insalubrious. Immediately to the north was Moorfields, which had recently been drained and laid out in walks, but it was frequented by beggars and travellers, who crossed it in order to get into London, tried not to linger. Adjoining Moorfields were Finsbury Fields, a favourite practising ground for the archers. Mile End, then a common on the Great Eastern Road, was famous as a rendezvous for the troops. The preparations for the coronation of King James I were interrupted by a severe plague epidemic, which may have killed over thirty thousand people. The Lord Mayor's Show, which had been discontinued for some years, was revived by order of the king in 1609. The dissolved monastery of the Charterhouse, which had been bought and sold by the courtiers several times, was purchased by Thomas Button for £13,000. The new hospital, chapel, and schoolhouse were begun in 1611. Charterhouse School was to be one of the principal public schools in London until it moved to Surrey in Victorian times, and the site is still used as a medical school. Chronicler of Stuart London, Samuel PepysIn January 1642 five members of parliament whom the King wished to arrest were granted refuge in the City. In August of the same year the King raised his banner at Nottingham, and during the English Civil War London took the side of the parliament. Initially the king had the upper hand in military terms and in November he won the Battle of Brentford a few miles to the west of London. The City organised a new makeshift army and Charles hesitated and retreated. Subsequently an extensive system of fortifications was built to protect London from a renewed attack by the Royalists. This comprised a strong earthen rampart, enhanced with bastions and redoubts. It was well beyond the City walls and encompassed the whole urban area, including Westminster and Southwark. London was not seriously threatened by the royalists again, and the financial resources of the City made an important contribution to the parliamentarians victory in the war. The unsanitary and overcrowded City of London has suffered from the numerous outbreaks of the plague many times over the centuries, but in Britain it is the last major outbreak which is remembered as the "Great Plague" It occurred in 1665 and 1666 and killed around 60,000 people, which was one fifth of the population. Samuel Pepys chronicled the epidemic in his diary. On the 4 September 1665 he wrote "I have stayed in the city till above 7400 died in one week, and of them about 6000 of the plague, and little noise heard day or night but tolling of bells." The Great Plague was immediately followed by another catastrophe, albeit one which helped to put an end to the plague. On the Sunday, 2 September 1666 the Great Fire of London broke out at one o'clock in the morning at a house in Pudding Lane in the southern part of the City. Fanned by an eastern wind the fire spread, and efforts to arrest it by pulling down houses to make firebreaks were disorganised to begin with. On Tuesday night the wind fell somewhat, and on Wednesday the fire slackened. On Thursday it was extinguished, but on the evening of that day the flames again burst forth at the Temple. Some houses were at once blown up by gunpowder, and thus the fire was finally mastered. The Monument was built to commemorate the fire: for over a century and a half it bore an inscription attributing the conflagration to a "popish frenzy". John Evelyn's plan for the rebuilding of London after the Great Fire.The fire destroyed about 60% of the City, including Old St Paul's Cathedral, 87 parish churches, 44 livery company halls and the Royal Exchange. However the number of lives lost was surprisingly small; it is believed to have been 16 at most. Within a few days of the fire, three plans were presented to the king for the rebuilding of the city, by Christopher Wren, John Evelyn and Robert Hooke. Wren proposed to build main thoroughfares north and south, and east and west, to insulate all the churches in conspicuous positions, to form the most public places into large piazzas, to unite the halls of the 12 chief livery companies into one regular square annexed to the Guildhall, and to make a fine quay on the bank of the river from Blackfriars to the Tower of London. Wren wished to build the new streets straight and in three standard widths of thirty, sixty and ninety feet. Evelyn's plan differed from Wren's chiefly in proposing a street from the church of St Dunstan's in the East to the St Paul's, and in having no quay or terrace along the river. These plans were not implemented, and the rebuilt city generally followed the streetplan of the old one, and most of it has survived into the 21st century. Richard Blome's map of London (1673). The development of the West End had recently begun to accelerate.Nonetheless, the new City was different from the old one. Many aristocratic residents never returned, preferring to take new houses in the West End, where fashionable new districts such as St. James's were built close to the main royal residence, which was Whitehall Palace until it was destroyed by fire in the 1690s, and thereafter St. James's Palace. The rural lane of Piccadilly sprouted courtiers mansions such as Burlington House. Thus the separation between the middle class mercantile City of London, and the aristocratic world of the court in Westminster became complete. In the City itself there was a move from wooden buildings to stone and brick construction to reduce the risk of fire. Parliament's Rebuilding of London Act 1666 stated "building with brick [is] not only more comely and durable, but also more safe against future perils of fire". From then on only doorcases, window-frames and shop fronts were allowed to be made of wood. In the winter of 1683–4 a frost fair was held on the Thames. The frost, which began about seven weeks before Christmas and continued for six weeks after, was the greatest on record. The Revocation of the Edict of Nantes in 1685, led to a large migration on Huguenots to London. They established a silk industry at Spitalfields. At this time the City of London was becoming the world's leading financial centre, superseding Amsterdam in primacy. The Bank of England was founded in 1694, and the British East India Company was expanding its influence. Lloyd's of London also began to operate in the late 17th century. In 1700 London handled 80% of England's imports, 69% of its exports and 86% of its re-exports. Many of the goods were luxuries from the Americas and Asia such as silk, sugar, tea and tobacco. The last figure emphasises London's role as an entrepot: while it had many craftsmen in the 17th century, and would later acquire some large factories, its economic prominence was never based primarily on industry. Instead it was a great trading and redistribution centre. Goods were brought to London by England's increasingly dominant merchant navy, not only to satisfy domestic demand, but also for re-export throughout Europe and beyond. William III cared little for London, the smoke of which gave him asthma, and after the first fire at Whitehall Palace (1691) he purchased Nottingham House and transformed it into Kensington Palace. Kensington was then an insignificant village, but the arrival of the court soon caused it to grow in importance. The palace was rarely favoured by future monarchs, but its construction was another step in the expansion of the bounds of London. During the same reign Greenwich Hospital, then well outside the boundary of London, but now comfortably inside it, was begun; it was the naval complement to the Chelsea Hospital for former soldiers, which has been founded in 1681. During the reign of Queen Anne an act was passed authorising the building of 50 new churches to serve the greatly increased population living outside the boundaries of the City of London. A view of London from the east in 1751The 18th century was a period of rapid growth for London, reflecting an increasing national population, the early stirrings of the Industrial Revolution, and London's role at the centre of the evolving British Empire. In 1707 an Act of Union was passed merging the Scottish and the English Parliaments, thus establishing The Kingdom of Great Britain. A year later, in 1708 Christopher Wren's masterpiece, St. Paul's Cathedral was completed on his birthday. However, the first service had been held on December 2, 1697; more than 10 years earlier. This Cathedral replaced the original St. Paul's which had been completely destroyed in the Great Fire of London. This building is considered one of the finest in Britain and a fine example of Baroque architecture. In 1762 George III acquired Buckingham Palace (then known as "house") from the Duke of Buckingham. It was enlarged over the next 75 years by architects such as John Nash. It would not be until the 19th century, however, that the palace would become the principal London royal residence. A century later, enlarged by John Nash.A phenomenon of 18th century London was the coffee house, which became a popular place to debate ideas. Growing literacy and the development of the printing press meant that news became widely available. Fleet Street became the centre of the embryonic British press during the century. London as engraved by J. & C. Walker in 1845 from a map by R Creighton. Many districts in the West End were fully developed, and the East End also extended well beyond the eastern fringe of the City of London. There were now several bridges over the Thames, allowing the rapid development of South London.During the 19th century, London was transformed into the world's largest city and capital of the British Empire. Its population expanded from 1 million in 1800 to 6.7 million a century later. During this period, London became a global political, financial, and trading capital. In this position, it was largely unrivaled until the latter part of the century, when Paris and New York began to threaten its dominance. While the city grew wealthy as Britain's holdings expanded, 19th century London was also a city of poverty, where millions lived in overcrowded and unsanitary slums. Life for the poor was immortalised by Charles Dickens in such novels as Oliver Twist. In 1829 the prime minister Robert Peel established the Metropolitan Police as a police force covering the entire urban area. The force gained the nickname of "bobbies" or "peelers" named after Robert Peel. 19th century London was transformed by the coming of the railways. A new network of metropolitan railways allowed for the development of suburbs in neighboring counties from which middle-class and wealthy people could commute to the centre. While this spurred the massive outward growth of the city, the growth of greater London also exacerbated the class divide, as the wealthier classes emigrated to the suburbs, leaving the poor to inhabit the inner city areas. The first railway to be built in London was a line from London Bridge to Greenwich, which opened in 1836. This was soon followed by the opening of great rail termini which linked London to every corner of Britain. These included Euston station (1837), Paddington station (1838), Fenchurch Street station (1841), Waterloo station (1848), King's Cross station (1850), and St Pancras station (1863). From 1863, the first lines of the London Underground were constructed. The urbanised area continued to grow rapidly, spreading into Islington, Paddington, Belgravia, Holborn, Finsbury, Shoreditch, Southwark and Lambeth. Towards the middle of the century, London's antiquated local government system, consisting of ancient parishes and vestries, struggled to cope with the rapid growth in population. In 1855 the Metropolitan Board of Works (MBW) was created to provide London with adequate infrastructure to cope with its growth. The Crystal Palace in 1851.One of its first tasks was addressing London's sanitation problems. At the time, raw sewage was pumped straight into the River Thames. This culminated in The Great Stink of 1858. The polluted drinking water (sourced from the Thames) also brought disease and epidemics to London's populace. Parliament finally gave consent for the MBW to construct a massive system of sewers. The engineer put in charge of building the new system was Joseph Bazalgette. In what was one of the largest civil engineering projects of the 19th century, he oversaw construction of over 2100 km of tunnels and pipes under London to take away sewage and provide clean drinking water. When the London sewerage system was completed, the death toll in London dropped dramatically, and epidemics of cholera and other diseases were curtailed. Bazalgette's system is still in use today. One of the most famous events of 19th-century London was the Great Exhibition of 1851. Held at The Crystal Palace, the fair attracted visitors from across the world and displayed Britain at the height of its Imperial dominance. The Houses of Parliament from old Westminster Bridge in the early 1890sAs the capital of a massive empire, London became a magnet for immigrants from the colonies and poorer parts of Europe. A large Irish population settled in the city during the Victorian period, with many of the newcomers refugees from the Great Famine (1845-1849). At one point, Irish immigrants made up about 20% of London's population. London also became home to a sizable Jewish community, and small communities of Chinese and South Asians settled in the city. London entered the 20th century at the height of its influence as the capital of the largest empire in history, but the new century was to bring many challenges. London's population continued to grow rapidly in the early decades of the century, and public transport was greatly expanded. A large tram network was constructed by the London County Council, through the LCC Tramways. And the first motorbus service began in the 1900s. Improvements to London's overground and underground rail network, including large scale electrification were progressively carried out. Like the rest of the country, London suffered severe unemployment during the Great Depression of the 1930s. In the East End during the 1930s, politically extreme parties of both right and left flourished. The Communist Party of Great Britain won a seat in the House of Commons, and the far-right British Union of Fascists received extensive support. Clashes between right and left culminated in the Battle of Cable Street in 1936. The population of London reached an all time peak of 8.6 million in 1939. Large numbers of Jewish immigrants fleeing from Nazi Germany, settled in London during the 1930s, who settled mostly in the West End. Firefighters putting out flames at a bomb site during the blitzDuring World War II, London, as many other British cities, suffered severe damage, being bombed extensively by the Luftwaffe as a part of The Blitz. Prior to the bombing, hundreds of thousands of children in London were evacuated to the countryside to avoid the bombing. Civilians took shelter from the air raids in underground stations. The heaviest bombing took place between 7 September 1940 and 10 May 1941. During this period, London was subjected to 71 separate raids receiving over 18,000 tonnes of high explosive. Less intensive bombing followed over the following few years as Hitler concentrated on the Eastern front. Towards the end of the war, during 1944/45 London came under heavy attack again by pilotless V-1 and V-2 rockets, which were fired from Nazi occupied Europe. Immediately after the war, the 1948 Summer Olympics were held at the original Wembley Stadium, at a time when the city had barely recovered from the war. London's rebuilding was slow to begin. However, in 1951 the Festival of Britain was held, which marked an increasing mood of optimism and forward looking. From the 1950s onwards London became home to a large number of immigrants, largely from Commonwealth countries such as Jamaica, India and Pakistan, which dramatically changed the face of London, turning it into one of the most diverse cities in Europe. However, the integration of the new immigrants was not always easy. Racial tensions emerged in events such as the Brixton Riots in the early 1980s. Greater London's population declined steadily in the decades after World War II, from an estimated peak of 8.6 million in 1939 to around 6.8 million in the 1980s. However it then began to increase again in the late 1980s, encouraged by strong economic performance and an increasingly positive image. London's traditional status as a major port declined dramatically in the post-war decades as the old Docklands could not accommodate large modern container ships. The principal ports for London moved to the downstream to the ports of Felixstowe and Tilbury. The docklands area had become largely derelict by the 1980s, but was redeveloped into flats and offices from the mid-1980s onwards. The Thames Barrier was completed in the 1980s to protect London against tidal surges from the North Sea. In 2000, London-wide government was restored, with the creation of the Greater London Authority (GLA) by Tony Blair's government, covering the same area of Greater London. The new authority had similar powers to the old GLC, but was made up of a directly elected Mayor and a London Assembly. London was also recognised as one of the nine regions of England. Some of the modern landmarks in the London of today. From left to right are the Gherkin, the former Natwest Tower and the new Broadgate Tower under construction.At the turn of the 21st century, London hosted the much derided Millennium Dome at Greenwich, to mark the new century. Other Millennium projects were more successful. One was the largest observation wheel in the world, the "Millennium Wheel", or the London Eye, which was erected as a temporary structure, but soon became a fixture, and draws four million visitors a year. The National Lottery also released a flood of funds for major enhancements to existing attractions, for example the roofing of the Great Court at the British Museum. On July 6, 2005 London won the bid to host the 2012 Olympics. However, celebrations were cut short the following day when, on July 7, 2005, London was rocked by a series of terrorist attacks. More than 50 were killed and 750 injured in three bombings on London Underground and another aboard a double decker bus near Russell Square in King's Cross. 400 — fewer than 5,000? The first Census was in 1801, so early dates are estimates based on archaeological density of sites compared with known population of the City of London between 1600–1800 (i.e., 50,000). Dates from 1300 onwards are based on what is probably better evidence, from historic records. Figures for 1891 onwards are for Greater London in its 2001 limits (Greater London did not exist until 1965). Figures before 1971 have been reconstructed by the Office for National Statistics based on past censuses in order to fit the 2001 limits. Figures from 1981 onward are midyear estimates (revised as of 2004), which are more accurate than the censuses themselves, known to underestimate the population of London. London's urban area now extends beyond the boundaries of Greater London, and it had an estimated population of 8,505,000 in 2005.